Donors have pledged significant sums to the recent 2014 UN appeals for Syria and the region, Central African Republic (CAR) and South Sudan. While each conflict continues to cause massive displacement of people, there are big differences in needs and donor responses. The Syrian crisis is the largest – using the requirements of the UN’s – ‘appeals’ (known as response plans). In recent weeks nearly US$3 billion of humanitarian assistance has been pledged or committed to Syria and neighbouring countries, including funding inside and outside of the UN response plans. This is equivalent to only 45% of the response plan requirements. 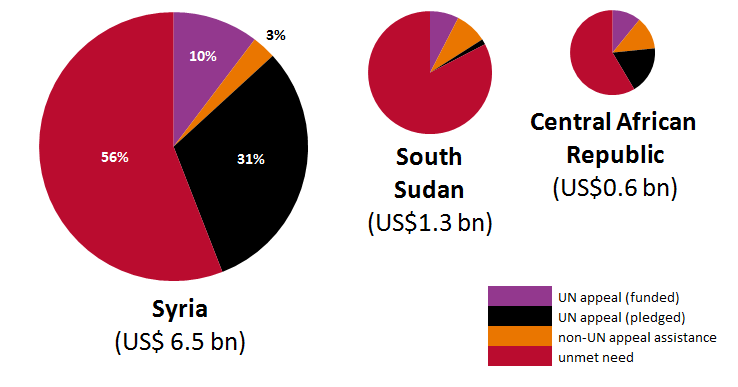 For the CAR crisis it is 33%, and for South Sudan just 15%. The Syrian conflict is almost three years old; the massive displacement of people (an estimated 9 million internally displaced persons and refugees) contributes to the requirements within the US$6.5 billion consolidated appeal. Pledges at the Syria pledging conference in January were considerable (US$2.4 billion), but funds still need to be committed. Widespread violence erupted in South Sudan in December 2013 and rapidly worsened, displacing almost 900,000 people in little over a month. The UN appeal increased 15% in January 2014, and is likely to rise further, but remains only 7% funded. Sporadic violence in CAR escalated at the end of 2013, leading to over a million people being displaced, the majority internally. The consolidated appeal of US$0.6 billion is less than the other crises, but is also expected to increase and is currently only 11% funded. Appeals and humanitarian assistance data were downloaded from UN OCHA FTS on 4 February 2014. Displacement figures are from UNHCR and also downloaded on 4 February 2014. People awaiting registration in Syria (around 50,000) are not included in displacement figures above. Requirements data are the latest figures for UN OCHA appeals. ‘Non-UN appeal assistance’ includes all humanitarian assistance recorded by UN OCHA outside of the appeal and is used to illustrate international response. Syria response figures include the Regional Response Plan (RRP) and the Syrian Humanitarian Assistance Response Plan (SHARP).